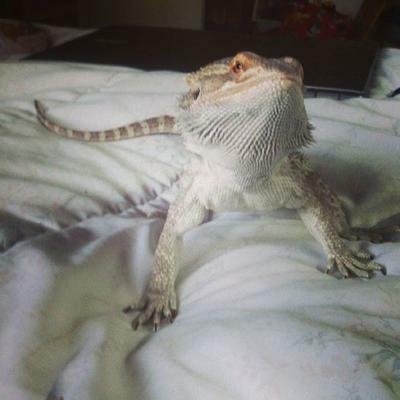 I have a 10 month old bearded dragon named Cookie, my 4 year old named him, I have never had any issues with him. We got him when he was maybe a month old. My son plays with him daily and never seems to mind him carrying him around the house and watching my son playing with his toys. Then last night my husband and I got home at 11pm when cookie is fast asleep. By the way I had had him out all day and let him bask in the window sill, with no issues. So I decided to go in the bedroom and pick him up so he could snuggle for a little while, he usually loves to fall asleep on my husband's chest. I turn on the light and he opens his eyes, then put my hand in and pet his head, then pick him up and he is fine until I get into my husbands and my room and he puffs up and begins to hiss. So I put him on the floor and think he got scared at something so I turned off the ceiling fan and the box fan we had in the window. and he is still really puffed up with his beard all black and doesn't want anyone to come near him. (Note; He has only bit me once accidently while hand feeding him and now wont hand feed in fear of biting again.) My husband eventually gets him to calm down enough to allow him to pick him up but he still puffs up in his hand and hisses at him. I'm glad this happened while my son is staying the week at his grandpas but I want to know what exactly we did wrong to make sure not to scare him or make him mad again. It's tough to say. These little guys can be unpredictable! Sometimes the black beard can be a sign of a health issue, but this sounds like he percieved a threat of some sort. His beard should return to normal soon, if it doesn't -take him to the vet soon!